Combine the wickedly wonderful flavours of caramel and banana in this easy shortbread recipe. For the caramel, place the butter and sugar into a non-stick pan over a low heat, stirring until the butter melts and the sugar dissolves. Add the condensed milk and slowly bring to the boil, stirring continuously, to make the caramel. As soon as the mixture thickens and begins to smell of caramel, remove from the heat. For the shortbread, preheat the oven to 170C/340F/Gas 3. Cream the butter with the sugar in a large bowl until it is light and fluffy. Sift the cornflour and plain flour into the bowl. 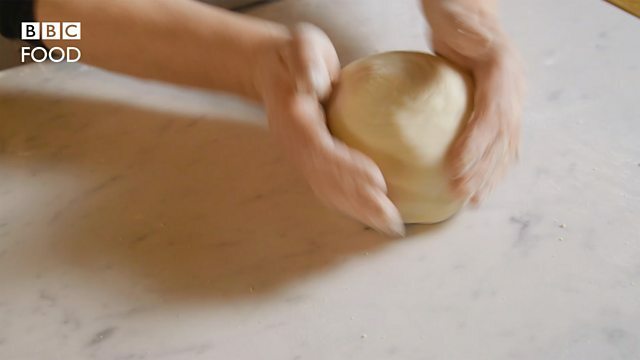 Mix and gently knead the dough until it comes together in a ball. Line a 20cm/8in x 30cm/12in baking tin with non-stick baking parchment. Roll out two-thirds of the dough to fit the tin and lay it inside, pressing it neatly into the edges. Spread three quarters of the condensed-milk caramel evenly over the base (the rest will keep in a covered bowl in the fridge for up to two weeks). Lay the banana slices over the caramel and then crumble the remaining third of the dough over the top. Bake for 20 minutes. The caramel should have bubbled up a little among the dough and the top of the shortbread should be golden-brown. Leave it to cool in the tin for five minutes before cutting it into squares. Allow to cool completely before removing from the tin. To serve, reheat the shortbread squares. Serve with banana ice cream and a drizzle of caramel sauce. Decorate with a sprig of fresh mint.